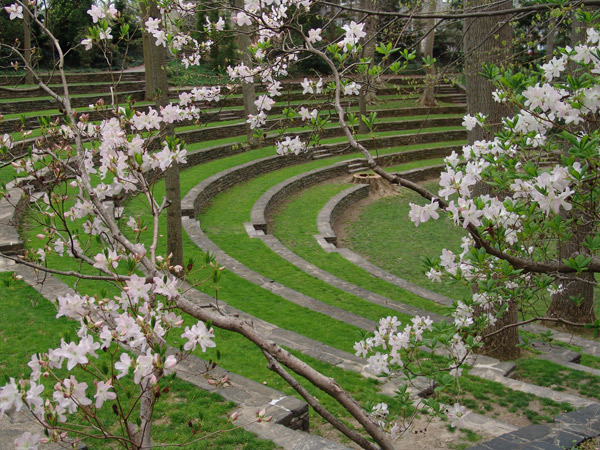 Designed by Philadelphia landscape architect Thomas Sears and completed in 1942, this outdoor amphitheater provides the backdrop for Swarthmore College’s commencement ceremonies. The project was funded by alumnus Thomas McCabe and dedicated to Arthur Hoyt Scott, graduate of the class of 1895 and benefactor of the Scott Arboretum. 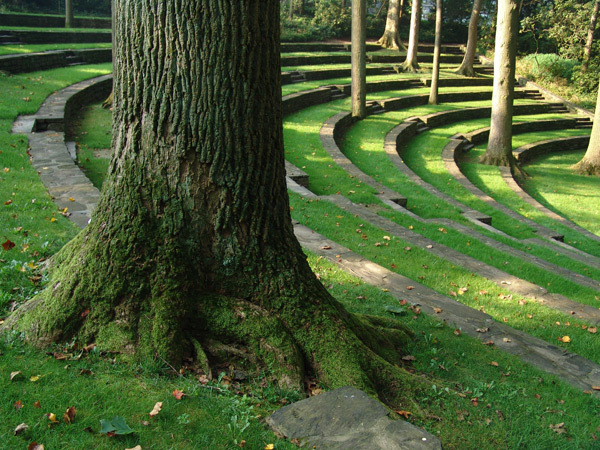 The naturalistic open-air theater was built on the west side of the campus on the dilapidated site of the Magill Outdoor Auditorium. 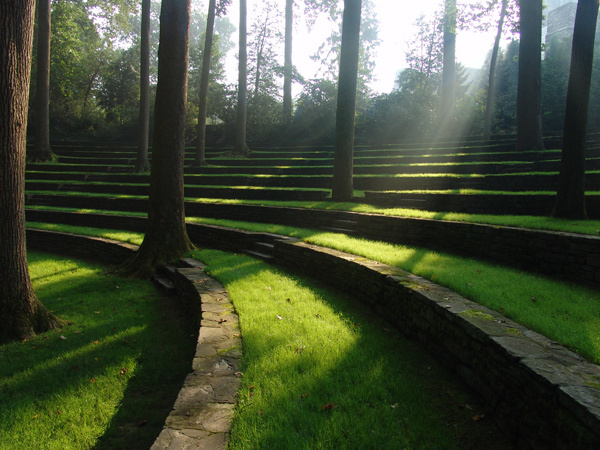 Paths and stone steps wind through native birch, oaks, and dogwoods of Crum Woods, opening onto the theater which is built into a steep, natural slope. 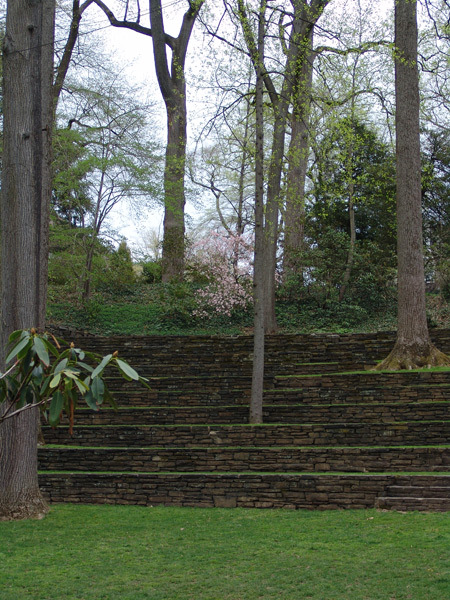 Screened by holly, oriental spruce, and red cedars, the 220-foot long amphitheater is edged by a low stone wall edged with mature rhododendrons. Eight curving retaining walls, each two feet tall and comprising layered native schist slabs descend the 23-foot drop and create terraced, grass-covered seating. The stone walls provide seating along the front edges of the terraces, which are 7.5 feet deep and connect via sets of stone steps placed at intervals within each wall. Sixteen mature tulip poplars and white oaks, spaced randomly, create a canopied “ceiling” for the audience. At the bottom of the wooded slope is a flat, turf-covered proscenium floor, behind which rises the turf-covered stage, elevated by low stone walls. 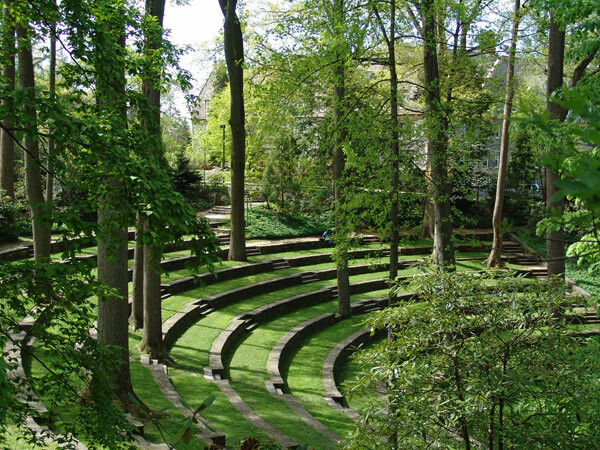 The amphitheater is part of Swarthmore’s 300-acre Scott Arboretum.